Opportunity Cost: The value of the next-best alternative that must be forgone in order to undertake an activity. If you have 100 Rs and with this 100 Rs you can either buy a shirt or watch a movie. If you will watch the movie then the opportunity cost of watching the movie is the value of shirt that you would have bought in place of movie. 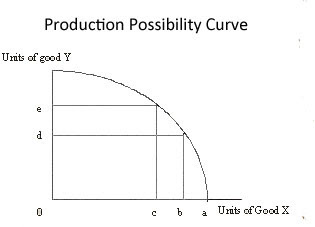 Sacrifice of commodity X from point B to point C to get extra units of commodity Y from D to E.
Sacrifice of commodity X from point B to point C = Opportunity Cost to get ed units of good y. Thank you so much for explaining opportunity cost in detail. I was looking for examples of implicit cost and explicit cost to clear my understanding and found a very good piece of information over here. Opportunity cost and sunk cost may be it will help in the further understanding of these costs. Thanks for your detailed post. Really enjoyed it.